I am so excited to share our first Filipino dish on our blog! I’m a first generation Filipino-American and have been learning to cook traditional Filipino recipes from my parents and grandparents ever since I was little. Chicken adobo is the Philippines’ national dish and is so easy and flavorful. 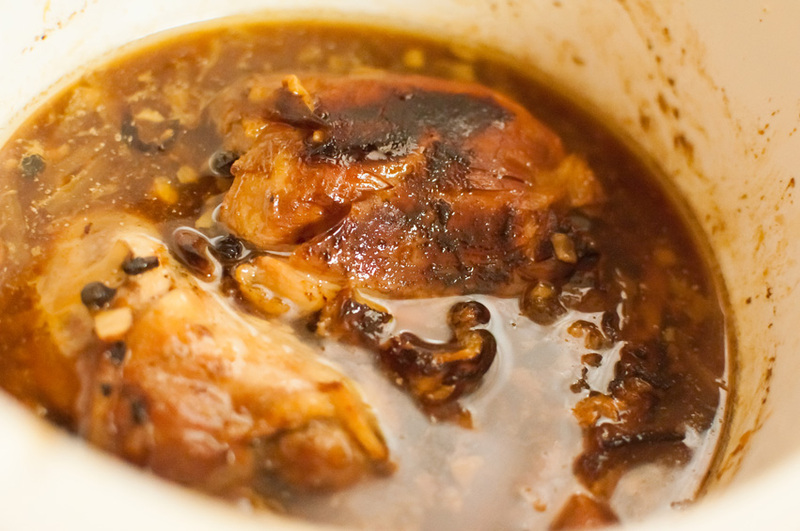 Adobo is stewed chicken in vinegar, soy sauce, pepper, onions and garlic. It had a very distinctive savory, yet tart, flavor…so satisfying! When you throw everything in the crockpot, it’s even less stressful and you can’t go wrong with super slow-cooked meat. We hope you enjoy this sometime soon! CROCKPOT INSTRUCTIONS: Throw half the onions, garlic, bay leaves and peppercorns in the bottom of the crockpot. Polk holes in chicken with a fork. Add the chicken on top with the remaining onions, garlic, bay leaves, peppercorns, vinegar, soy sauce and water over top. Slow-cook on high for 4 hours, or low for 6 hours. Halfway through, mix it all so everything is covered with sauce. After it’s cooked, you can quickly brown the outside of the chicken in an oiled sauté pan on high heat. Put back in pot with the sauce. STOVETOP INSTRUCTIONS: Polk holes in chicken with a fork. Combine the chicken, soy sauce, vinegar, water, garlic, onion, peppercorns and bay leaves in a large bowl or pan/pot you’ll be cooking in, and marinate in the fridge for 2-3 hours or overnight. After marinating, season chicken pieces with a bit of salt and pepper. Quickly brown outside of chicken in an oiled pot over high heat. Pour all the marinade over chicken, including garlic, onions, peppercorns and bay leaves. Bring to a boil. Turn heat on low, cover and slow cook for about 30-40 minutes until cooked through, about 170 degrees F internal temperature. Halfway through, mix it all so everything is covered with sauce. Serve chicken adobo with steamed veggies like Bok Choy, broccoli or okra. If you’re not watching your carbs, you can also serve with some healthy grains like brown rice or quinoa. Ladle sauce over the top and garnish with scallions. Enjoy!